The zoo is one of those places that I hear about and immediately connect with children. 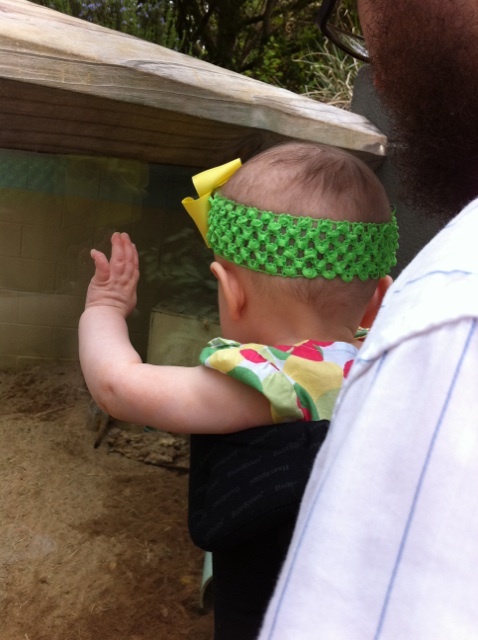 I’ve only been to a zoo once before taking Ella this past weekend and it was when I was a nanny during the summertime. 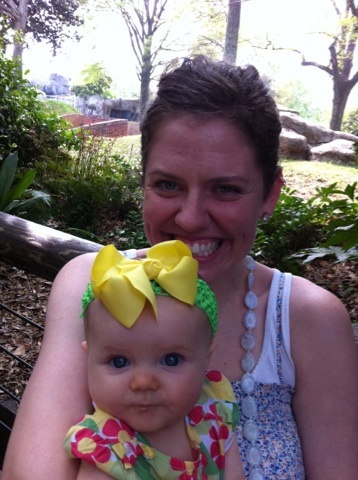 Therefore, I was really excited to take Little Miss to the Zoo Atlanta! She was excited, too and put on her party pants (aka, her ruffly shorts which I didn’t take a picture of, because I am a terrible mother, but I digress). We are bit of Disney snobs, so we weren’t holding high expectations for the zoo after being to Animal Kingdom about 500 times. 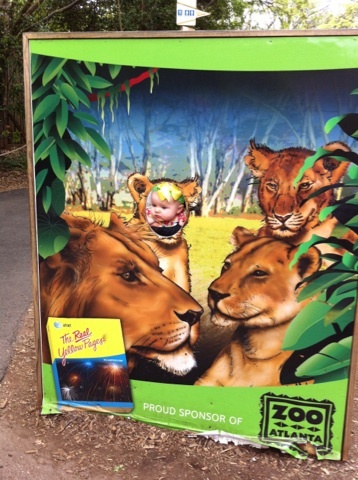 But, this zoo was so nice! It was really big and we didn’t even see everything in this visit! We are definitely planning to make this a regular hot spot for the Phillips crew. We got to see lots of things, like a baby panda, a baby gorilla, elephants, tigers, giraffes, etc, etc. So, right before this picture was taken, I was telling John how we needed to get a picture of the three of us since my mom was with us to take it. Then, soon after I exclaimed how we need more pictures, I spot this lovely gorilla statue. The best part was that no one even cared about it. No line, no crowd, nada. Perfect. Well, not so much. The second we get ourselves situated, which, included me trying to balance Ella on the gorilla’s leg, John trying to help, me exclaiming in an irritated tone that he “doesn’t understand what I’m trying to do” (aka, I thought it was the coolest idea ever to get her positioned on there and I was too tired and blazing hot/sweaty to think rationally about how I was reacting to his help when he didn’t know “my plan”), 10 million people form a line to get a picture with the gorilla statue. Immediately, some child ran up to the gorilla to touch it (you think it’s the kid in the above picture? you’d be wrong). 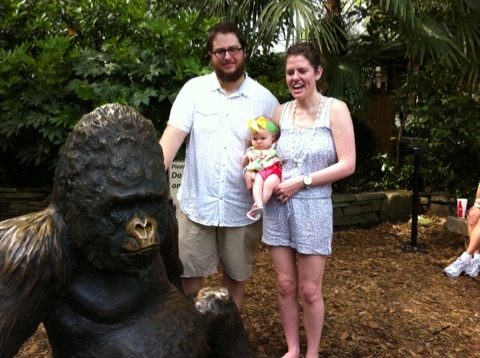 The parents quickly yelled at the child that we were “trying to take a picture”, which let’s face it, I’m still trying to dangle my child off of the gorilla leg and my husband is getting snapped at because he just doesn’t understand my artistic expression. But, yeah, we’re trying to take a picture, kid. The perfect picture (in my brain anyways). So, that kid instantly obeys and returns to the line. Then, out of my peripheral, comes the kid you see in the above picture. Does this child get reprimanded like the previous child of literally two seconds before? Nope. His dad immediately drops down to one knee, with his khaki cargo shorts on, and starts snapping 80 pictures a second of precious little Jimmy playing with the gorilla statue. Nevermind the family of 3 in the background trying to get the perfect picture of their little girl’s first trip to the zoo. Don’t be fooled, precious little Jimmy is still playing with the gorilla, my mom just cropped him out of the shot. 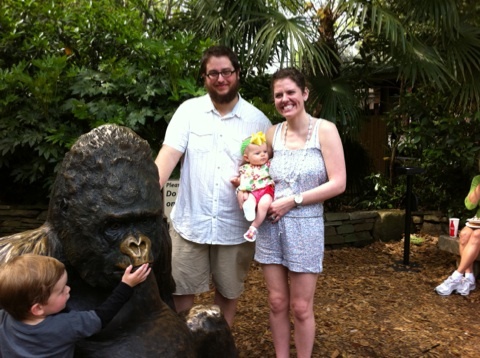 His dad has already made the complete half-circle around the gorilla snapping photos of his playdate with the statue. He also made sure to get 2,400 pictures in 30 seconds while getting down on one knee, back up on his feet, back down on both knees…every angle was going to be shot. Regardless of the family of three looking for the perfect picture. As you can see, John is angry, Ella is staring at statue (thankfully, oblivious), and I am clearly mid-sentence. But, what am I saying, you ask? Promise not to think I am as terrible as I feel? I yelled, staring straight at the mother in this scenario, but I was really “talking to John”. You know how that move goes? Yeah, well, I yell, “C’mon! Let’s get out of here! If these people are that rude to not wait their turn, I don’t want the picture!”. As soon as we walked away, we started laughing. It was like a, “wait, did all of that just happen in 3 minutes or less?” moment. baaaaaaaaaaahahahahaha. i think you really need to find your joy, geez…says the mom who regularly yells at other children and/or their parents at the park. i so feel ya on this, my friend.